Thane is an honorary title presented by the jarl of a hold to individuals of high esteem. The bestowed title is one of both recognition and prestige. Thanes may be chosen due to their importance to the city or for their heroic deeds. It is possible to become a thane of every hold regardless of which side in the Civil War is chosen (although it is impossible to become a thane of Eastmarch if no side is chosen). Each jarl has their own requirements for the title and may bestow the honor on multiple people. Grants you a personal housecarl follower (if available). Grants you a symbolic weapon of the city. Guards will forgive any bounty of less than 2000 gold (once per hold). However, a crime can be pardoned twice if a hold is captured during the civil war and the new jarl appoints the player Thane. The general process for becoming a thane comes down to a relatively general formula with the exception of Whiterun, where it is initially achieved by completing the quest Dragon Rising, and does not require the steps below to complete, unless you have joined the Stormcloaks and completed Battle for Whiterun. You befriend the jarl through a quest or favors. The jarl asks you to demonstrate your value to the hold by assisting the people (five people in holds with major cities, three people in the other holds; in the Rift the conversation with the jarl is skipped, but you still have to help the people). The jarl asks you to purchase a house in the city, if the hold is one of the five with major cities - Whiterun (Whiterun), The Rift (Riften), Eastmarch (Windhelm), Haafingar (Solitude), The Reach (Markarth). The jarl grants the title of Thane and all that comes with it. If Hearthfire is installed, then the three minor holds of Falkreath (Falkreath), Hjaalmarch (Morthal) and The Pale (Dawnstar) will also appoint a housecarl, and grant the right to purchase a plot of land on which you may build your own residence. Your housecarl, if not taken as your follower, will remain in the jarl's residence awaiting instructions, if you do not buy the land or build a house on it, although you will still remain Thane. (The same happens if you are granted the Thaneship of Whiterun during the Dragon Rising quest.) Thus, only Winterhold lacks the opportunity for the player to acquire a residence in the hold: likewise there is no housecarl available for the player in Winterhold. Progress made in assisting the people is dependent on disposition of citizens of the hold. Each citizen whose disposition is raised to friend counts towards the objective. Note that if you befriend the same citizen twice, the citizen only counts once for the Thane quest. Also, if a friend dies, you do not lose progress. In most cases, there is one quest for each citizen which will befriend that citizen. Some citizens may have more than one quest which will befriend them. Many citizens have no specific quest available at all. A friend must be an ordinary citizen of the hold, not just living in it; members of Orc strongholds and Khajiit caravans do not count towards the total. ^aIf Season Unending has been used to change the jarls of holds, the new jarls will allow you to become thane without completing any other prerequisite quests, with the exception of the Jarl of the Rift. ^bAll honorary weapons listed are randomly assigned enchanted melee weapons. More information can be found on this page. ^cDragon Rising grants Thane status by itself. There are no further requirements to become Thane of Whiterun if Balgruuf is still Jarl of Whiterun, and there is no other way to become Thane of Whiterun while he is Jarl. ^dElisif the Fair remains Jarl of Haafingar even if it is conquered by the Stormcloaks. ^eIt is impossible to become Thane of Eastmarch without taking one or the other side in the Civil War: you must either join the Stormcloaks to win Ulfric's favour and commit permanently to their side by conquering Whiterun for them (which is beyond the point-of-no-return that allows defecting to the Imperials), or join the Legion, win the civil war outright for the Empire (since the city cannot change hands during Season Unending), remove Ulfric from power in Windhelm and curry favour with his pro-Imperial replacement. NPCs that are thanes are typically identified through dialogue. There is no specific faction marking for thanes. Bryling Haafingar Bryling's House Owns Rockwallow Mine. 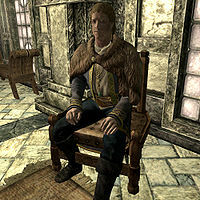 Dengeir of Stuhn Falkreath Hold Dengeir's House Former Jarl of Falkreath, deposed by his nephew Siddgeir. Siding with the Stormcloaks will allow him to regain the title of Jarl. Erikur Haafingar Erikur's House Sister is Gisli. Mjoll the Lioness is declared by the Rift's jarl, Laila Law-Giver, to be a champion of the people. Her virtue and heroic nature are extolled by Laila, but this only represents one facet of being a thane. If the jarl that named you thane is replaced through the events of the Civil War or via Season Unending, you will lose the title, though you can regain it by speaking to the new jarl. You do not need to complete favor tasks a second time, because the new jarl is always grateful to you for your help in installing him or her and will accept that as a favor task in itself. The only exception is the Rift, where both Maven and Laila require you to complete a non-repeatable task as a prerequisite for the title. If the jarl is replaced and you then regain your thaneship, the bounty forgiveness will reset and you will be able to use it a second time under the new jarl. As the holds of the Reach, Falkreath, Hjaalmarch, the Pale and Winterhold can change hands twice throughout the game, this theoretically allows you to clear your bounty three times in these holds. It is strongly recommended that before completing the Dark Brotherhood contract to kill Helvard, you either become thane of Falkreath first, or do Siddgeir/Dengeir's quests later to regain their grace. If Erikur or Bryling die, their housecarls (Melaran and Irnskar Ironhand, respectively) will replace them as thanes. If you lose your Thane status in your hold (due to the jarl that granted it being removed by the Civil War or Season Unending), then your housecarl will still call you thane but you will be unable to use your status to avoid being arrested by the guards until it is reinstated. This page was last modified on 17 February 2019, at 21:55.